The finished hole for the tank should be 60"x 90"x 28" deep. Remove any sharp rocks or sticks. Smooth out the sidewalls and bottom. If possible, add about 2" of gravel or sand on the bottom. It's not mandatory but will leave a flat and even base. The proper depth will leave the top lip of the tank about 2" above the ground. This will allow you have a finished grade that slopes away from the guzzler for good surface drainage. Place tank into the hole, add some weight inside with water or sandbags, and check with a carpenter's level. It's not necessary to aggressively pack the back filled dirt. It's better to get some water into the tank and let the soil settle naturally. With the guzzler lid in place, smooth the soil up to the lid. Slope the surface grade slightly away from the guzzler for runoff. While backfilling you'll want to stabilize the tank. Dirt and sand will have a tendency to sift under the bottom of the tank and it can creep upward if not weighted down properly. So, add some weight inside the tank. You'll also want to minimize the inward pressure on the sidewalls which can cause them to bow inside and cause loss of some tank volume. Consider using one of the methods below. 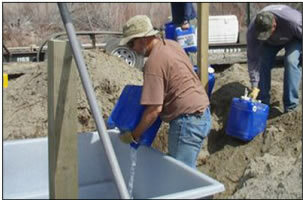 If water is available, add 50-100 gallons then partially backfill dirt. Add more water and then backfill more dirt. Alternately filling and backfilling will help keep the walls from bowing inward or outward during backfill. If you don't have water around during the install, you can add some sandbags to the floor or have someone stand inside. You can also add a temporary cross brace to support the sidewalls while back-filling. Remember, you don't need to aggressively pack down the fill material. It should settle just fine on it's own. Maintenance - Please check the guzzler periodically and remove any debris that has accumulated on the ramp. Remove the lid and check to see that the overall system is clean and uncontaminated. Project Photos - We appreciate pictures you are willing to send of your guzzler project and game shots. Every guzzler project is different and can provide useful ideas for others. We always look forward to hearing from you.